By the Bees honey is a raw honey- the concentrated nectar that comes straight from the extractor- unheated, pure, unpasteurized and unprocessed. Considered the healthiest choice with the most nutritional value, raw honey contains amylase- a beneficial enzyme concentrated in bee pollen. Other health benefits of honey include that it is antibacterial, hygroscopic, and a wonderful source of antioxidants. 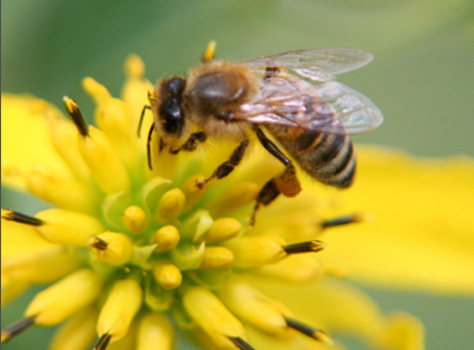 Many believe that eating pollen laden raw honey from the area local to where you live can help with seasonal allergies. Others use honey to heal wounds and burns, and treat minor acne. However, most just like to enjoy it by eating it! We recommend consuming honey in it's raw state, unheated , with all the aromas, enzymes, and health benefits intact. Our honey is derived from nectar gathered from our local Wildflowers- most of all Milk Thistle. 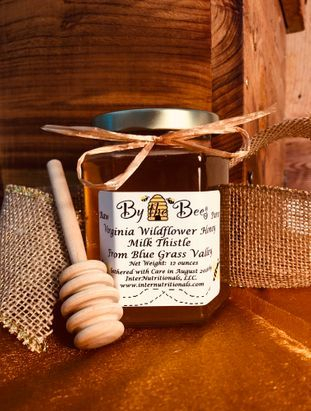 We raise our bees at our farm located in Highland County, Virginia, known as Virginia's "Little Switzerland", an area of clean and pristine mountains and valleys, family owned farms, and small businesses like our own. Our honey is fresh, pure, and attractively packaged in 12 ounce containers, with U.S. handcrafted wooden honey dippers included. We invite you to take one home for your breakfast table, or to give as a wonderful gift of health for friends and family! © 2019 InterNutritionals, LLC.. All Rights Reserved.